A tiny NASA satellite has unfurled a solar sail high above Earth and eagle-eyed skywatchers are hoping to spot the shiny spacecraft from the ground. NASA confirmed on Friday (Jan. 21) that its NanoSail-D solar sail satellite successfully deployed its 100-square-foot polymer sail in low-Earth orbit and was operating as planned. The actual deployment occurred a day earlier, on Thursday, and was later confirmed using beacon and telemetry data. But while radio and radar data indicate that the sail has unfurled, observers on the ground are still trying to make an actual visual sighting of NanoSail-D as it passes across the twilight sky. At least one Russian skywatcher has spotted a candidate that may have been the solar sail. Trying to actually see NanoSail-D solar sail as it passes over your location will be a bit more difficult than trying to spot the International Space Station or one of the thousands of other man-made objects orbiting our planet. Unfortunately, at this particular moment it appears that the angle of the sail relative to the sun and to prospective observers on the ground will be rather unfavorable, and as a result NanoSail-D has been very dim; quite likely invisible to the unaided eye. On Jan. 21, Ted Molczan, moderator of the SeeSat-L mailing list, attempted to sight NanoSail-D from his home just outside Toronto, Canada. Astronomers measure the brightness of sky objects in terms of magnitude. The lower an object's magnitude number, the brighter it appears. The full moon, for example, has a magnitude of about -12.7, while the star Sirius — the brightest star in the sky — typically shines at a magnitude of -1.4. Molczan was using 25 x 100 binoculars, and despite poor sky conditions could see stars with a magnitude 8, which is roughly six times fainter than the faintest star that could be glimpsed by the unaided eye. But NanoSail-D was not visible. "Had the satellite reached [magnitude] 6 or 7, I should have seen it," Molczan noted. Dan Laszlo, a veteran satellite observer stationed at Fort Collins, Colo., speculates that "it seems likely we are straining to see a large but backlit object with these (recent) passes." But from Yarovoye, Russia, observer Viktor Voropaev apparently had success; he observed a second magnitude object that was moving very closely along the projected track of the sail on the evening of Jan. 22. According to NASA's Mark Whorton at the Marshall Space Flight Center in Huntsville, Ala. — which is overseeing the solar sail flight— there are some prerequisites required in order to spot the NanoSail-D satellite. "NanoSail-D needs to be illuminated by sunlight for it to be seen from the ground, and it needs to be seen against a dark sky for sufficient contrast (so it will stand out). Since it flies at a relatively low orbit altitude, it is only illuminated by sunlight against a comparably dark background around dawn and dusk," Whorton has said. "Early in the mission it will be tumbling, so it really doesn't matter where it is in the sky, but later in the mission it will be aerodynamically stabilized. That means you will see it edge on when it is directly overhead." The best viewing opportunities to spot NanoSail-D will be in the later phases of the mission — as the solar sail's orbit decays and it enters more of the atmosphere, Whorton said. At that time, it will tend to be closer to the horizon rather than directly overhead. "However, these are just general guidelines — it will likely be good viewing just at all elevations as long as the sun has is close to setting or barely risen," Whorton added. And there is still yet another intriguing possibility that NanoSail-D might periodically reflect glints of sunlight back to Earth, making it appear to briefly "flash" or "flare" into visibility. Where to look and when? You stand your best chance of catching a glimpse of NanoSail-D if you know when it is passing over your area. The Heavens-Above website (http://heavens-above.com/) is providing sighting predictions of NanoSail-D for any place on Earth over the next 10 days. The skywatching website suggests that the sail might appear as bright as a magnitude 3 star when 50 percent illuminated, and viewed at a distance of 620 miles (1,000 km). It could appear as bright as a first-magnitude star when in 100 percent sunlight and viewed at perigee (its closest point to earth) a distance of 387 miles (623 km). Another site to try is: Real Time Satellite Tracking (http://www.n2yo.com/?s=25544). There, you can not only track NanoSail-D (and a variety of other satellites) on an ever-changing world map, but you can also get 5-day sighting predictions as well. And lastly, you can use an app (courtesy of Spaceweather.com) to get latest satellite predictions on your iPhone. The NanoSail-D solar sail's success is a comeback story of sorts for NASA. The breadbox-size satellite hitched a ride to space on Nov. 19 aboard NASA's larger FASTSAT research satellite. NanoSail-D was slated to eject from FASTSAT on Dec. 6, but apparently was stuck fast. On Jan. 19, however, NanoSail-D finally popped free from FASTSAT on its own, allowing NASA scientists to continue with what is the space agency's first successful solar sail test flight. 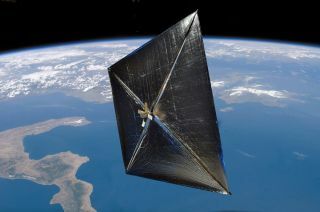 NASA's NanoSail-D mission is the second test flight to successfully deploy a solar sail in space. Japan successfully deployed Ikaros — the first spacecraft to use solar sail propulsion — in June 2010.